Register your interest in the post below, and be in to win a Daniel Wellington watch. They're cool 'preppy' style watches in the mid price rage ( $190 US appx) that will go wonderfully with the smart but casual styles. The striped straps are awesome. For men and women. Go and have a look at their range. Thanks Daniel Wellington ! Liking the rose gold on the ladies' models - thanks for the giveaway! I bought a belt with stripes like this just today! Would look smashing together, love it. I love the Classic Sheffield in rose gold so much! Love love love the Classic Sheffield in rose gold! Would go with EVERYTHING! Liking the Glasgow, Warwick and all the brown tones. best watch i've ever seen! Does leaving a comment count as registering my interest? What a wonderful classic design. Would love to win these!! Would be a classic timeless watch that would easily become a staple in anyones wardrobe. They look amazingly wearable - the best thing for a watch in my books ! I look for something that makes me want to put it on every morning. Time, be on my side! classic oxford or st. andrews. classy! Simple and classy - and rose gold too! I like the Classic St Andrews. Dig the huge watch face. Love the classic styles. Will have to start wearing a watch again! Wow would love to win one, they are so classy!! Love those watches, especially the rose gold and brown leather one ! Consider my interest registered! Those watches are AMAZING! Interest well and truly registered! I have been eyeing the Classic St Andrews Lady in rose gold for quite some time...best giveaway ever! Classic Oxford Lady. The nautical colors will definitely fit most of my wardrobe! The watches have sensible faces. It is a little unfortunate that the marketing is so preppy, as it limits their appeal to those of us allergic to the Newport, Rhode Island set. Still, there are non-stripey straps in the range. Arghhh! Best giveaway ever!! I'm so obsessed with Daniel Wellington watches, I've been in lust with this watch the moment I saw it on the Fancy app. I saved it to my camera roll and look at it every day!! If I could buy it, I would in a heartbeat! I need this 'timeless' piece of fashion in my life!! IF I WIN ONE COMPETITION IN MY LIFE, PLEASE LET IT BE THIS ONE!!! Wonderful watch! I love the Classic Sheffield in rose gold ! I'd love the Classic Bristol with leather band and rosegold ringcolour! I've been looking for a watch just like these! Consider my interest registered- please. I absolutely adore Daniel Wellington watches! Such a classic, I really think they will still look just as stylish on your wrist years from now. My favorite is the Classic St Andrews in silver, so timeless (in the good sense of the word I hope, haha). What a great giveaway! 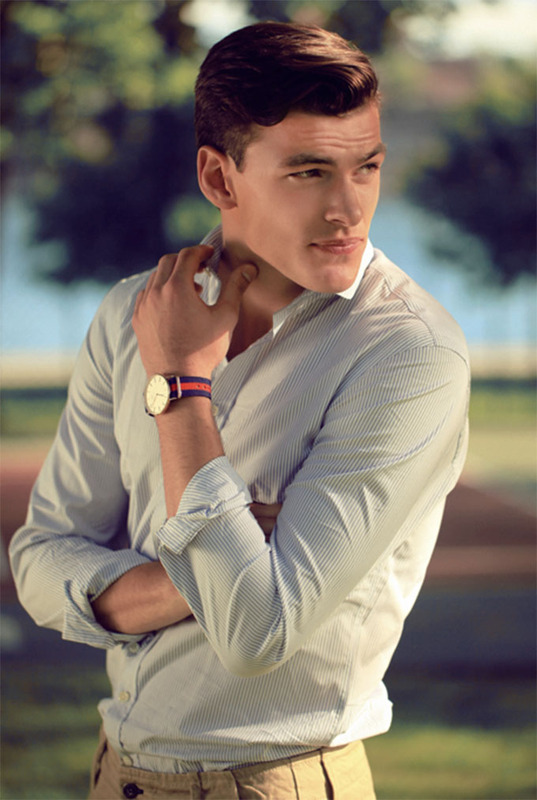 The Daniel Wellington watches look absolutely stunning. I really like the story behind the brand, it's quite intriguing! I also love the fact that the straps are interchangeable, so you can choose one to match the occasion. These are definitely some stylish, timeless beauties to "watch" out for! Loving the Classic Sheffield lady watch, looks so elegant. And maybe it would help with my terrible lateness to any sort of meeting! Sheer Elegance with a hint of attitude. Beauty, I can see myself sporting this elegant classic watch in my everyday wardrobe.